Price Drop! Was: $99.95 Now: $49.99. For a limited time only, while stocks last. 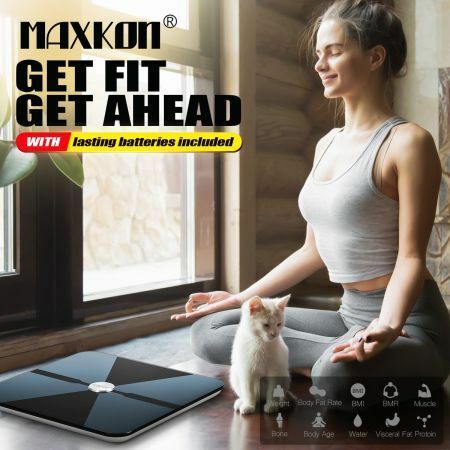 Measure your weight instantly and achieve your fitness goals with this digital body weight which allows tracking the data via Bluetooth to the apps of your Android or IOS device. Employing a high precision strain gauge sensor system with ITO coating surface, the digital scale ensures to calculate your body weight, body fat, water percentage, muscle mass, bone mass and etc. accurately. Thanks to its brilliant and large LED screen display, the bathroom scale will show the accurate weighing results clearly. Come with multi-user memory, the body fat scale ensures to store up to 8 users' data total. Featuring 20mm super slim design with durable 6mm tempered glass platform and high quality plastic base, the weight scale offers great safety, stability and flexibility in any home bathroom or exercise gym.